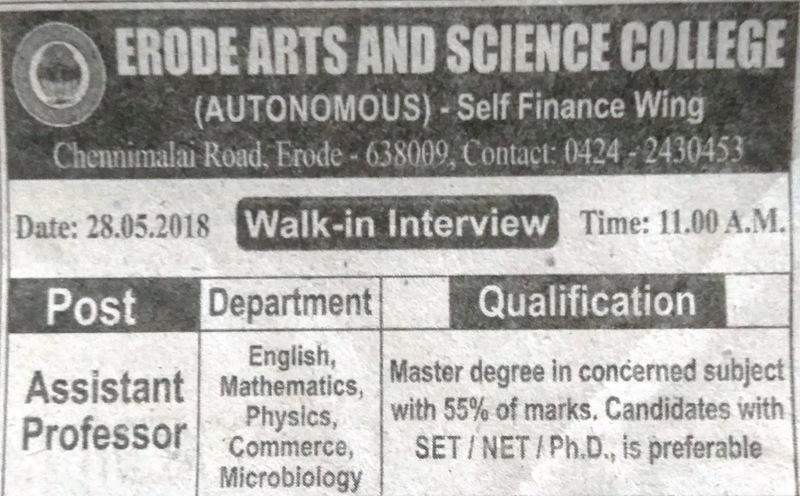 Erode Arts and Science College, Erode has advertised in Thinathanthi newspaper for the recruitment of Assistant Professor jobs vacancies. Interested and eligible job aspirants are requested to appear walk in from 28th May 2018. Check out further more details below. About College: Erode Arts and Science College, one of the premier Government Aided Colleges in Tamilnadu, founded by Sir. Chevalier Dr. R.A.N. Muthusamy Mudaliar with the cooperation of Philanthropists in and around Erode, has been distinct in that is serving first generation students coming for higher education from the rural areas and under privileged sections of the society to a larger extent. Erode Arts and Science College with its long history, healthy traditions and humble achievements, is a unique Institution in several ways.